The App Store on Mountain Lion pushes update notifications through Notification Center. Unfortunately, this also happens for users that are not system administrators (and so cannot run the App Store). How can I turn this off? Notification Center has preferences, where applications can be vetted, but App Store does not appear in this list. You can now simply go to System Preferences > App Store, and turn off "Automatically check for updates." No messing with firewalls, and just works with App Store. So just remember to check every now and then manually to find out when you have updates! 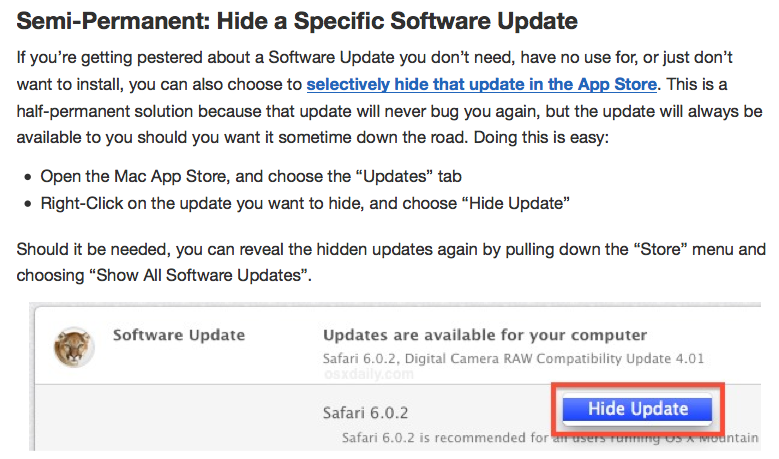 You can selectively disable notifications about specific software updates you don't care about (like useless App updates) by control-clicking the update inside the App Store to reveal a hidden "Hide Update" option. This is best for those who want to keep Notification Center active for all its other uses (calendar alarms, etc.) and who also want to be notified about critical software updates. It should permanently mute notifications about certain software updates (until that software comes out with a new update). The best solution I've found for this so far has been to ⌥+'click' the notifications menu icon in the top right and disable notifications. This resets every day though. As suggested, here's what I was able to figure out about the flags value by modifying entries through System Preferences and observing the resulting change in flag value. I was not able to find any meaning for the remaining fields. The value 134 is the original value that the appstore entry had (which was 150) but with the alert bit cleared. I thought one of the extra bits set on the appstore entry was the one that caused it to be hidden from the preference pane, but even after clearing them it did not show up. I recently discovered that you can dismiss individual notifications by clicking on the app store update notification, and swiping/dragging to the right. I do it about 20x a day because I don't have the time to restart my iMac every day for software updates. Click the arrow on the right for a drop down to select "block all incoming connections" and I keep it like this until I decide it's time to update everything. Open your Applications folder and navigate to the App Store application. Right click on the application and select ‘Show Package Contents’. Select the contents folder. Within this folder you will see an application named ‘Info.plist’. Copy this to the desktop or another folder. Open this file in Text Edit. There are various options within this file. Scroll down to the option which states. NSUserNotificationAlertStyle alert Change ‘alert’ to ‘none’. Save the file and copy it back to the location in which you found it. You will have to authenticate with your admin password to make the change since you are altering a protected system file. You may need to restart the App Store application, or your Mac. Credit for this idea is found on imgur. Update: This doesn't work, the key appears to be ignored for some reason. I think you might be able to change the default behavior of App Store.app by changing the NSUserNotificationAlertStyle plist entry from alert to banner. I just applied this change myself, but haven't been able to verify that it works because there haven't been any updates yet. killall NotificationCenter When you log out and back in to your Mac, the Notification Center icon in the menu bar will be missing. You can simply hide the update in the Mac APP Store or wherever your notification is coming from. Uh....for some reason I can't respond to Buscar up there who is talking about the whole <key>NSUserNotificationAlertStyle</key> thing, in response to "App Store Is Annoying". If you go to info.plist in the package contents, and it looks all XML-y, I think the trick to this is to find that line with NSUserNotificationAlertStyle inside the <key> tag, and then look below for the <string> tag, which should be sandwiching the word "alert". Just change "alert" to "none"... I think that'll work. Will restart & test out now. Open System Preferences > Software Updates, then uncheck the box that says "You will be notified when updates are ready to be installed". Not the answer you're looking for? Browse other questions tagged mountain-lion mac-appstore software-update notification-center . Change update frequency of App Store in Mountain Lion? Does Mail have to be open for Notification Center to work in Mountain Lion? When does the Mac App Store produce notifications? How to install app from App Store again on Mountain Lion (or on the new OS X)? How can I dismiss the App Store banner in Notification Center without taking an action? How can I disable App Store update notification for non-admin users?